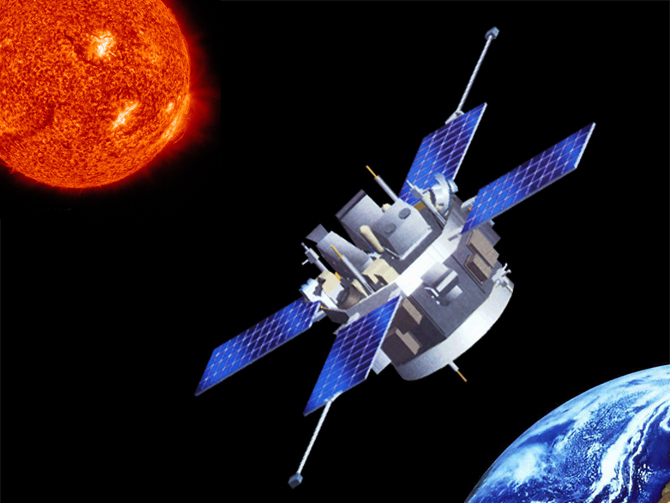 NASA’s Advanced Composition Explorer (ACE) observes a wide array of particles that flow toward Earth from the sun to better understand the great space weather system that connects the sun to our planet (Credits: NASA/H. Zell). In the quest to understand how the world’s weather moves around the globe, scientists have had to tease apart different kinds of atmospheric movement, such as the great jet streams that can move across a whole hemisphere versus more intricate, localized flows. Much the same must currently be done to understand the various motions at work in the great space weather system that links the sun and Earth as the sun shoots material out in all directions, creating its own version of a particle sea to fill up the solar system. For example, the sun sends out a steady outflow of solar particles called the solar wind and additionally giant, sudden explosions of material called coronal mass ejections or CMEs erupt out into space. Skoug studies a third kind of particle flow: jets of high-energy electrons streaming from the sun known as electron strahl. Through a new five-year study of observations of the strahl, Skoug and her colleagues have researched another piece of this giant space weather puzzle around Earth. Skoug says that each fast-moving electron is by and large constrained to move along magnetic field lines that flow out from the sun, some of which loop back to touch the sun again, others which extend out to the edges of the solar system. The charge on an electron interacts with the field lines such that each particle sticks close to the line, somewhat like a bead on an abacus – with the added motion that the electron gyrates in circles around the field lines at the same time. In general, the magnetic fields get weaker further away from the sun. A physical law that applies in those cases in which electrons are not pushed off course, or “scattered,” demands that the electron gyrations get smaller and more stretched out along the field line. If this were the only physics at work, therefore, one would expect the strahl to become a more and more focused, pencil-thin beam when measured near Earth. This measurement is done by NASA’s Advanced Composition Explorer (ACE) mission, but it shows that the expected focusing doesn’t quite happen. Indeed, the strahls come in a wide variety of sizes, so Skoug and her colleagues sifted through five years worth of ACE data to see if they could find any patterns. While they spotted strahls of all widths, they did find that certain sizes showed up more frequently. They also found that strahls along open field lines, those that do not return to the sun, have different characteristics than those on closed field lines, those that do return to the sun. On the open field lines, the most common width by far is about ten times the size of the thin beam of electrons expected if there had been no extra scattering. The closed field lines, however, showed a nearly equal number of strahls at that width and at a width some four times even larger. The strahls on the closed field lines showed an additional pattern. While the strahls might differ in width, they did not tend to differ in the total number of electrons passing by. This suggests that the different shaped strahls – which often come from similar places on the sun — may have been the same in composition when they left the sun, but were altered by the path they traveled and scattering they encountered along their journey. While each piece of statistical information like this may seem slightly esoteric, together they help constrain what kinds of scattering might be at work in space. There are numerous types of these waves, however, traveling at different speeds, in different sizes and in different directions, and no one yet knows which kinds of waves might be at work. Research like this helps start the process of eliminating certain scattering options, since the correct version must, of course, cause the specific variations seen by Skoug and her colleagues.